We will be sharing a number of procedures and components used throughout the project with the public in this page. Files with our designes can be downloaded, 3D-printed and assembled in any laboratory. Please note: all work is licensed under a Creative Commons Attribution-NonCommercial-ShareAlike 4.0 International License. Source files are available on request contactig the authors. fully operational incubator including up to 15 vessels for the continuous cell culture. This folder introduces the experimentator to the setup and procedures for the experiment. Important aspects of the setup are described. For the theoretical background the user is referred to the literature on the special subjects. Some footnotes are included to guide the experimentator to operate specific version of the machine. A low-cost pinch valve where you can program instructions for multiple sections of tubing. Instructions on how to assemble and control the vale are included within the compressed archive. We wish to exchange our experience and deigns with DIY comunity. 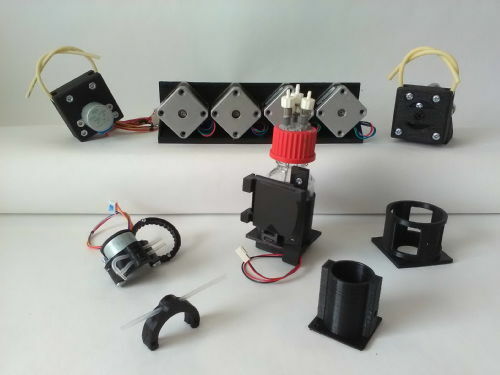 We use 3D printing for fabricating our custom bioreactors that have unique hardware and software solutions not available on the market, and also to substuntially reduce the cost of the components, which is important when expanding the array of reactors.